This one is a concept album after my own heart. 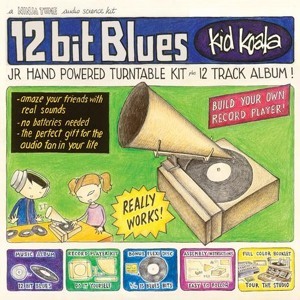 Digging in the crates for old school blues legends like Son House, Vancouver-born Kid Koala combines turntablism and glitched lo-fi production with the lumbering guitar and piano riffs of the 12 bar blues, creating something epic. ‘The 12 Bit Blues’ is out now on Ninja Tune. He’s also about to begin a world tour featuring dancers, puppets and a huge cardboard gramaphone(?). Playing Manchester UK on the 13th October. This entry was posted in News & Events, The Robot Recommends and tagged 12 Bit Blues, 13th October, blues, hip hop, Kid Koala, Manchester Tour Date, ninja tune, Son House, Turntablism by 1nejack. Bookmark the permalink.